The post Reborn Sterling leads Manchester City’s Champions League charge appeared first on World Soccer Talk. London (AFP) – As Pep Guardiola’s Manchester City advance upon the Champions League group phase, previously maligned winger Raheem Sterling appears to have been reborn. Sterling, 21, joined City from Liverpool in a fractious 44 million pounds ($57.8 million, 51.1 million euros) move last year, but flattered to deceive and ultimately lost his place in the starting XI. 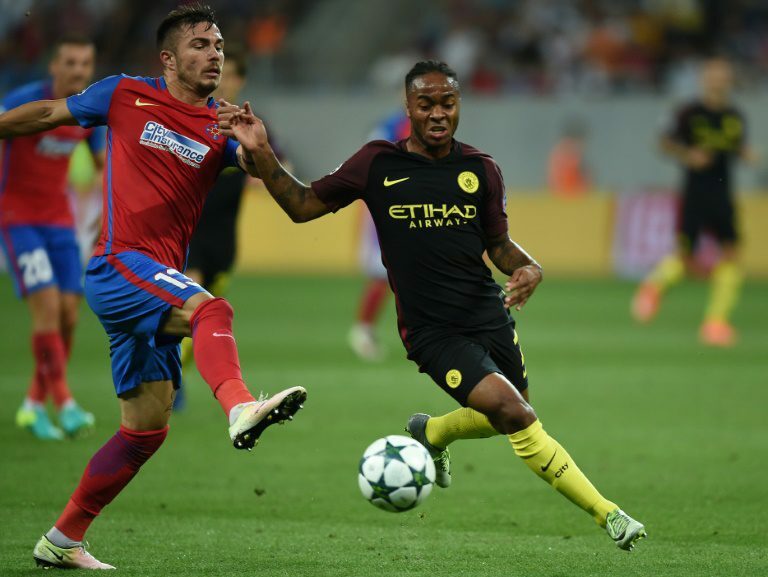 He was also derided for some insipid England displays at Euro 2016, but he is thriving under Guardiola and inspired City to a 5-0 win at Steaua Bucharest in their Champions League play-off round first leg. “Obviously he’s been criticised a lot in the last year, but the way he’s responding is great,” said teammate Kevin De Bruyne ahead of Wednesday’s return leg against Steaua. “He’s a great player. I don’t care what people say about him after last year or the Euros. These things happen. Footballers have ups and downs. Sterling set the tone for City in last week’s first leg in Bucharest, winning an early penalty (which Sergio Aguero squandered) and laying on goals for David Silva and Aguero, who scored a hat-trick. He won a penalty as City beat Sunderland 2-1 on the Premier League season’s opening day and impressed again in last Saturday’s 4-1 win at Stoke City, unselfishly setting up a late goal for Nolito. Sterling’s return to form has not escaped the attention of new England manager Sam Allardyce. “People say in football that when you have the dip, it’s how well do you overcome it?” Allardyce told reporters on Monday. “When you do overcome it, you end up being a much better player and generally your career lasts a lot longer after getting through that period. With the tie against Steaua effectively over, Wednesday’s game at the Etihad Stadium gives Guardiola an opportunity to hone his tactical innovations, such as his use of full-backs in central midfield roles. He may also hand playing time to some of his fringe players, but it remains to be seen whether outcast goalkeeper Joe Hart will be granted a first start of the campaign. Wednesday’s other games are all more finely poised, with Dutch giants Ajax level at 1-1 with Rostov ahead of the second leg in Russia. The heavyweight tie between Roma and Porto, which concludes in the Italian capital on Tuesday, is also delicately balanced at 1-1. Monaco, quarter-finalists in 2015, carry a 2-1 lead into their home game with Villarreal. Dundalk’s hopes of becoming the first Irish team to reach the group stage appear slim as they travel to Legia Warsaw needing to overturn a 2-0 first-leg deficit. Like City, Celtic appear all but home and hosed after crushing Israeli representatives Hapoel Beer-Sheva 5-2 in the home leg of their tie. But their fans face a probe by UEFA after unveiling dozens of Palestine flags during the game in Glasgow. Israeli police have vowed to confiscate any Palestinian flags brandished by any of the expected 250 away fans during Tuesday’s return fixture in Beersheba.